With the sport of dog showing being so popular with adults, it’s only natural that the younger members of the family become involved. Junior handling introduces young people into the sport with their own organisation and competitions. When showing a dog at a competition, any person taking the dog into the show ring is called a ‘handler’. 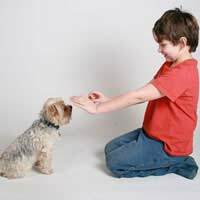 Consequently a young person handling a dog is classed as a ‘junior hander.’ No difference is made to the age or ability of a hander in open competition – it is the presentation of the dog and the quality of the dog that is being judged. The Kennel Club caters well for the young handlers with its Young Kennel Club (YKC). Age categories are 6-11, 12-16 and 17-24. There are two handling competitions held each year at Crufts, YKC Handling and the YKC National Show Handler. Places are well fought for and entrants have to qualify at participating shows held around the country during the preceding year. Members of the YKC can collect points when they win a place in a junior handling class. A book that records the wins can be obtained from the YKC office. When a class is won the handler asks the judge to sign the book as proof of the win. Once 150 points have been recorded the handler is awarded with their handling badge – a much coveted item amongst junior handlers. Young handlers can also compete in other canine sports apart from dog showing such as agility, obedience, flyball and heelwork to music. The junior handlers put older exhibitors to shame with their impeccable handling and smart outfits. The older exhibitor should look to these youngsters for lessons in how to compete! Young handlers can also train in stewarding – an important side to dog shows. No show could go ahead without the work of the ring steward, be it in the show ring, agility or obedience. YKC members can train for qualifications in stewarding that puts them in great stead for their future in the show ring as adults. Young people can also help out at general shows where, working with older stewards they will gain experience and confidence. There is another junior organisation that is recognised by the Kennel Club and the YKC, this is the Junior Handling Association (JHA). Youngsters who compete and win classes with JHA sponsored classes and events can use these wins towards awards with the YKC. For details of this organisation contact Mrs. C E Cartledge 01344 424144. Most shows around the United Kingdom whether they are small open shows or large championship shows – even breed club open and championship shows usually have a few junior handling classes. If your club doesn’t offer these classes in junior handling, approach the committee and request that they are put into the next show scheduled. Young people are the future of the dog world, it is important that they are encouraged and trained so that the world of the dog show can go forward into the next century positively with continued improvements and promise.